Published on the website of the Patriarchate of Constantinople. The leading role of the ecumenical patriarch is the cause of the break with Moscow. An ancient church in Kiev donated to Bartholomew I. President Petro Poroshenko rewards the two bishops of Muscovite obedience who took part in the Council of Unification. Moscow (AsiaNews) - The Patriarchate of Constantinople has published on its website the official version, in Greek, English and French, of the founding document of Ukrainian autocephaly[i] . The authoritative tone of the submission to Constantinople of the Ukrainian Church in all the canonical issues is impressive, as well as the symbolic concession of the Holy Chrism for the sacraments. The ecumenical patriarchate thus confirms its own "primatial" vocation within universal Orthodoxy, the crux that led to the break with the patriarchate of Moscow and other Churches united to Moscow. The new Church should be called "Most Holy Church of Ukraine", and not "in Ukraine" as in earlier published versions (each Church receives a special denomination according to the institutive Tomos). Ukrainian autocephaly extols the leading role of Constantinople, which preserves the "stavropegial rights", that is of direct presence in the country through its own exarchs. On January 13th, President Poroshenko, together with Metropolitan Epifanyj, visited the Church of the Savior in Berestovo, which will be available to the Ecumenical Patriarchate. It is one of the oldest Ukrainian churches, where in 1157 the remains of prince founder of the city of Moscow, Jurij Dolgorukij, were laid. 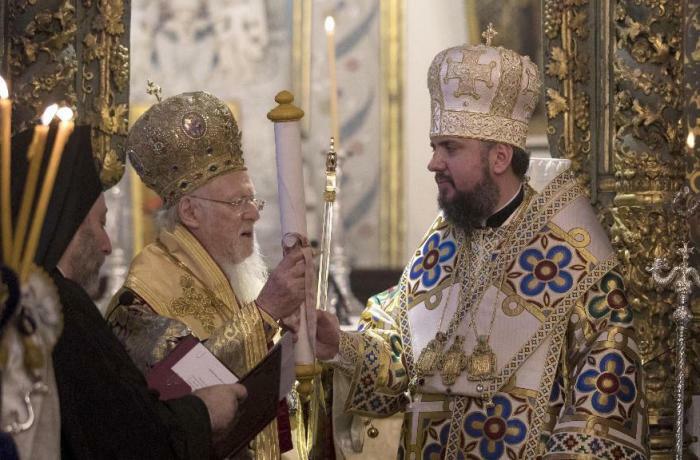 The church had not been open to the public, having been under restoration for almost 20 years, and will now become one of the centers of the "ecumenical" pastoral leadership of the new Ukrainian orthodoxy. In an interview with the BBC, one of the Constantinopolitan exarchs, Archbishop Daniil, warned the "patriarch emeritus" Filaret (Denisenko) not to interfere in the ecclesiastical administration, leaving the metropolitan Epifanyj (his former secretary) "the freedom to act as a true primate of his Church ... Be a spiritual grandfather, a father, advise, but let him do his job! ". Daniil recalled that Filaret was allowed to keep the title (self-assigned) of patriarch "because of his old age", even if officially he is only the former metropolitan of Kiev. Furthermore, on 11 January the Constantinopolitan Synod appointed archimandrite Mikhail (Anishenko) as "head of the restored Ecumenical Stavropegia of Kiev", who for years served as "spiritual pastor" of the Orthodox community of Antalya in Turkey, belonging to the metropolis of Pisidia. On the same day, President Poroshenko conferred the state order of Prince Yaroslav the Wise on the two metropolitans of the Moscow jurisdiction who participated in the Council of Unification, Simeon (Shostatsky) and Anatolij (Drabinko). Below the full text of the Tomos of Autocephaly for the Ukrainian Church.